Lori Byars is the owner and “mad baker” of Cheshire Cat Confectionary, a manufacturer and distributor of uniquely designed cookies. 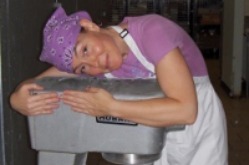 Unlike many in this business, Lori has never taken a cooking class or worked in a restaurant. Her experience comes solely from doing what she loves, and Cheshire Cat Confectionary is driven by her creative vision and passion. After graduating from college, Lori spent the better part of sixteen years on the road as a Stage Manager with several Broadway national tours, including The Lion King, Jersey Boys, and Mary Poppins. During that time, she gained widespread notoriety for creating tasty and unusual treats in her trusty toaster oven. In June of 2012, she came to SCORE looking for help in developing her business plan and in getting financing. Her mentor, Mitchell Morris, says that “Lori was the most determined individual I have encountered in over eight years at SCORE. She planned to open her business in September 2012, and nothing was going to stop her”. And true to her word, by September Cheshire Cat Confectionary was open for business, selling online with a complete selection of specialty cookies. During her first Holiday season, Lori’s company produced and sold over 1000 cookies. While over 40 different Gift Boxes of pre-designed cookies are available, the SHOW ME custom order option is by far the most popular selection. This choice allows customers to have a completely unique cookie which is custom created just for them.